Today’s blog is about my recent dinner at Harvest Seasonal Grill. 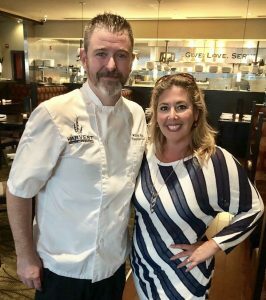 I was invited to check out their new Fall menu so I could share my experience with all of you. 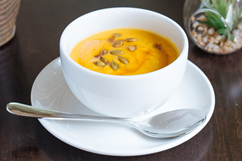 My last two posts on Harvest both featured previous Spring menus. The Fall menu was released the end of September and will run through the holidays at which time the new Winter menu will be launched. My companion and I were shown to our table and soon greeted by our server Jake, who ran through the menu layout with us. My companion had some questions on the wines. 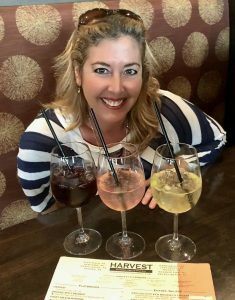 Jake was very knowledgeable about the wines on the menu and exceptionally helpful in his explanations..I always enjoy Harvest’s seasonal sangria flights so that is what I decided to begin with. My companion opted for a Cab Franc blend called Involuntary Commitment from Napa Valley. Harvest has a large number of wine varietals that you don’t see on other restaurant menus. My Sangria Flight consisted of: White Caramel Apple, Rosé Ginger Pear, and Red Blood Orange Pomegranate. The Rosé sangrias have been my favorite in the past, but this time, the Red Blood Orange Pomegranate got my vote for top pick. Now onto the food tastings. Chef Bill came out to say hello and after a brief discussion, he offered to send out a few dishes for us to try. 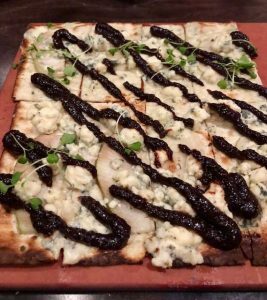 We started off with the Pear & Bleu flatbread. (Spoiler alert: this was my favorite item of the entire evening). The flatbread was PACKED with flavor and they were very generous with their toppings which were well distributed. Next out were the Brussels Sprouts, Butternut Squash Dip and Tuna Poke. There definitely was a butternut squash theme going on with our selections on this evening. So if you’re a butternut squash lover, be sure to head over to Harvest Seasonal Grill right now to get your fill of butternut squash! 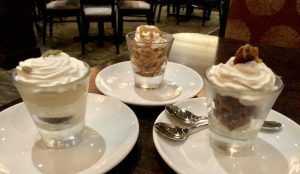 For dessert, we were presented with their minis:one was a Spiced Apple, one was Pecan something and one was a Key lime cheesecake. In all honesty, I did not have room to taste any of the desserts, but my companion did and said the Spiced Apple had an abundance of cayenne in it and the Pecan one was a bit hard and the Key Lime tasted mostly like vanilla frosting. I guess the desserts must have been off on this day, because this is quite unusual to have a miss on 3 out of 3. I have always enjoyed their desserts in the past and won’t let this one “off day” ruin my coming in again and giving them a try. WHO: Harvest Seasonal Grill & Wine Bar, Delray Beach’s season-forward, farm-to-table eatery and wine bar owned by the Dave Magrogan Group, announces their new fall menu featuring an assortment of seasonal dishes, refreshing cocktails and over 50 wines available by the glass now available through the fall season. WHAT: As the season’s change, you can always look forward to a bountiful new menu at Harvest Seasonal Grill & Wine Bar. 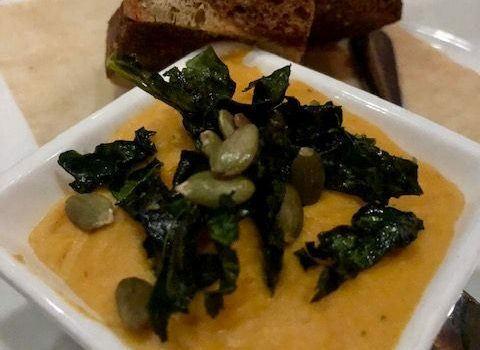 The fall menu features dishes that use local, seasonal ingredients resulting in the freshest, tastiest, most nutritious meals possible in a celebration of autumnal produce. 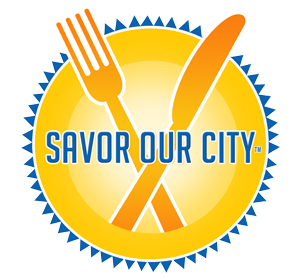 WHERE: Harvest Seasonal Grill & Wine Bar: Delray Place, 1841 S. Federal Hwy. #402, Delray Beach, FL 33483.